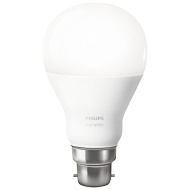 alaTest has collected and analyzed 18 reviews of Philips 929001137101. The average rating for this product is 4.8/5, compared to an average rating of 4.5/5 for other products in the same category for all reviews. We analyzed user and expert ratings, product age and more factors. Compared to other products in the same category the Philips 929001137101 is awarded an overall alaScore™ of 89/100 = Very good quality. Linked easily with Echo Plus and works as stated on package. Pack of three best value and worked straight out the box. It does what it says! Might be worth investing in a smart switch as week, to save other people trying to find your phone to switch it on. Philip Hue Light Bulbs are brilliant. I can increase or decrease their brightness. Turn them on or off, via the Home App, from wherever I am, at home or away. At any time, I choose. Power or what! Part of the Philips Hue lighting system - it works as expected. No experience as yet of the true lifespan of these products. We had the hue light system for Christmas as a gift but needed an additional bulb. The lights come on when you near your home which is useful as you don't need to turn the lights on as your enter the house! Very useful.